Cres Cor has been a moving force in mobile Food Service history since 1936. This family-owned company is centrally headquartered near Cleveland, Ohio. With over 275,000 square feet of state-of-the-art manufacturing and distribution facilities, they have made a company-wide commitment to unsurpassed reliability and superb customer service. Prior to using Justifacts, Cres Cor had been working with a background check vendor which relied heavily on the Cres Cor HR department to initiate the hiring process. 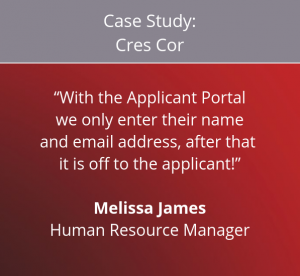 For years, Cres Cor had struggled with a time-consuming, paper-focused process that required both HR and applicants to take multiple steps in order for their vendor to perform an employment screening search. Justifacts helped Cres Cor by offering the Applicant Portal System which allows users to send a request directly to their applicants enabling them to securely complete only the necessary personal information and sign the associated waivers required to process their background check. The process of collecting all of the data from the employee, copying all 4 pages of the application, and performing credential data entry is no longer necessary. 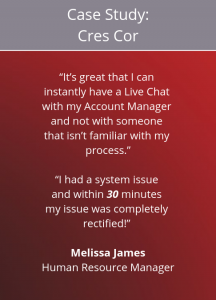 Melissa stated: “With the Applicant Portal, we only enter their name and email address, after that it is off to the applicant!” Once the Applicant Portal request is received by the applicant a step-by-step process is provided which includes a mouse-over signing technology, to obtain a ‘wet signature’ online to further speed up processing.